In The Death Camps of Croatia, Raphael Israeli shows that throughout Yugoslavia during World War II, anti-semitism was both deeply rooted and widespread. 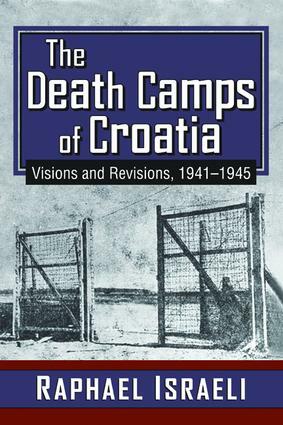 This book traces the circumstances and the historical context in which the pro-Nazi Ustasha state, encompassing Croatia and Bosnia, erected the Jadovno and Jasenovac death camps. Israelidistills fact and historical record from accusation and grievance, noting that seventy years later, the gap in research and the collection of data, memoirs, and oral histories has become almost irreparable. This volume meets the challenge, basing its conclusions on evidence from participants from the period. The battle between the Serbs and the Croats is not likely to be settled any time soon. Both sides have accused the other of the wrongdoings that everyone knows occurred. While the German Nazis, Croat Ustasha, Serbian collaborators, Cetnicks, and Bosnian Hanjar recruits are often seen as the wrongdoers, there were individuals who helped the Jews, hid them at great risk, and enabled them to survive. These people absorbed the Jews in their own ranks, and gave them the means to fight; they were the only people who helped the Jews.